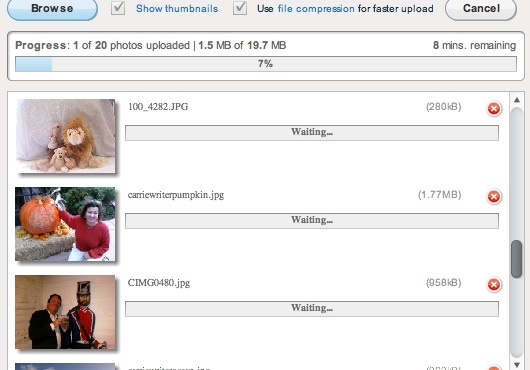 A screen capture of the Kodak upload page. I liked that you can easily track your progress via the handy tracking displays. Those who know me know that in addition to my loving photography and being a shutterbug (yes, that's me photographing my squash soup! ), I also love photo books, particularly since they make great, affordable holiday gifts around this time of year. So over the weekend I decided to experiment with two popular programs, Kodak and Shutterfly, both companies I like and have ordered from before, for products ranging from t-shirts, to prints and calendars. I was also motivated by a recent promotion I'd received from Shutterfly for a free photobook ($16 value), as long as the customer paid the shipping, so I was off and running. I loved the crop and edit tool that's available once you've downloaded your photos and are ready to find tune your photo book. I could not only easily crop images as needed, but could easily delete and/or rearrange photos using the cool drag and drop feature, so I could edit any page. including adding captions and customized text for the cover page. I also liked the backdrop template selections. There was a good variety, and design wise they were pleasant and didn't compete with the images. "Simple Path creates an instant photo book from selected albums, whether on Facebook, a home computer or on Shutterfly. The application automatically populates the photos onto pages and then allows for quick customization: including the ability to change styles, add captions and rearrange pictures and pages. The service allows users to not only pull from their Facebook photos, but also from friends’ Facebook albums, tagged photos, and mobile uploads.One of the more interesting aspects to the new service is that it takes into consideration for Facebook’s lower resolution images. As a result, Shutterfly will automatically detect image size and chooses the optimal layout for each photo in the book." I had just organized my photos on my desktop for my photobook so I didn't use the Facebook app, but I'm going to try it next time. Checkout was fast and easy and I got my e-mail confirmation right away. Pricing: Pricing was reasonable, at $12.99 for a 7x9 book, which can hold from 40 to 400 photos. Since I had my coupon, I just paid about $3.00 for shipping. Wow, it took me almost 3 hours to set up my photo book! Now, this is taking into consideration that I swapped out a few images, did some editing, and adjusted the layout a few times, but even so, a large part of this was the download issue. I have a slightly older Mac (2005) so maybe there was a compatibility issue, but since the program basically worked, and there was no specification listed regarding compatibility, I went with it, but still was rather shocked at the download time. I downloaded about 45 photos altogether, which caused some script issues on my computer and it froze up a few times. Also, there wasn't a tracking screen, so I was a bit in the dark about the processing time and any progress I was making. I had some similar "getting stuck" episodes when I went to download additional photos, which I only did because the original 20 I had downloaded didn't adequately fill the 20 pages, and there were awkward gaps. I didn't like that the Save button connected only to the Project Gallery, so you would have to exit and return to the files again to confirm the project had been saved. I would have preferred a simple Save icon that confirmed the project had been saved then and there in the Window I was already in. 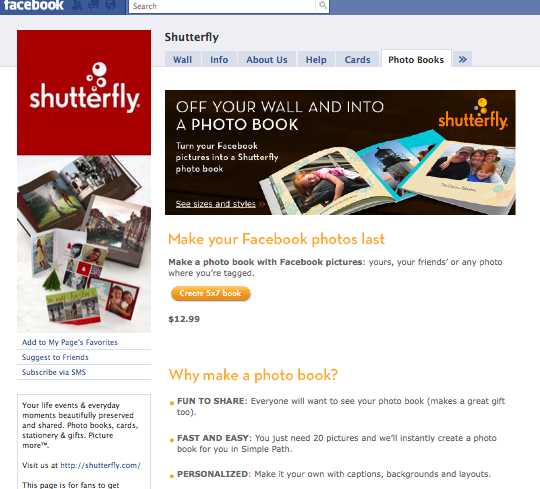 Summary: If it weren't for the download problems, I would have given Shutterfly a 9.0 for overall use and effectiveness. I did go ahead with the order, but if I hadn't had the coupon, I'm not sure I would have completed the process and gone ahead with the purchase. So my total score: 5.0 out of 10. I liked that right away as soon as I logged in and chose my project, the screens were highly interactive, include a screen that suggested the kinds of projects that lent themselves to photo books, or "Fun Ideas," such as holidays and trops, baby or family pix, and storytelling. There was a Live Chat pop up also right away, that made me feel like I had some company as I worked, although I didn't need to click on it, so I didn't. There was also more up front communication on what I was getting with my photo book: "1 photo per page side," and "photos organized by date taken" were welcome informational messages, as well as a suggestion on how many photos to start uploading for a 5.7 book - at least 40. Good to know! 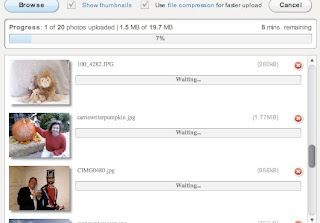 As shown in the screenshot above, Kodak showed you your upload progress, so I knew not to run off and start reading "War and Peace," while waiting for the uploads. I got up from my desk and came back a minute later, and the upload was complete. Yes! I also liked how easy it was to add new photos, with no delay. Kodak's program not only allowed me to choose background styles, but also allowed me to select borders of varying widths, an option which I chose and experimented with for a bit. There was a wide variety of cover template selections, and also a choice of Views to select while you were working, such as Single Page or Thumbnail. I was able to upload all my photos, add cover text, and customize my layout and color choices all in about an hour and a half, much faster than with Shutterfly, and encountered no system issues. The Kodak logo seemed to pop up on the outside of the back cover, with no apparent way to delete it. It's one thing when you are getting a free product, as in the case with Vistaprint, for example, and the logo appears on the back of the business card. But for a paid product, there is no reason why the customer doesn't have an opt-out. I like Kodak, but I don't work for them nor do I want to advertise on a personal project. It was great that you could rearrange the order of the photos, but the drag and drop feature was awkward and very slow. This might have been an issue with my Mac, but all other menu items seemed to work fine. So, I did not rearrange the layout as much as I would have like to. There was no cropping tool as part of the photo editor. If part of the photo image was blocked, you could change the layout feature and adjust it that way, but what if the user wanted to keep the layout and simply adjust a selected portion of the image? This didn't make too much sense to me, but I went ahead and used the "Change Layout" feature and it did fix the problem. Summary:I liked the speed of the Kodak program and the customization options for color choices, templates, and layouts, and I also liked the high degree of customer communication and interactivity. The lack of social media integration for photo uploads was a bit disappointing as was the lack of a cropping tool. Price was, a 5 x 7 book at under $10 was fair. Total points: 8.0 out of 10.00. If I had to choose one program for my next project, would have to go with Kodak based on the superior photo upload processing. Let's face it, speed is the name of the game when you're creating projects like this. Now it's your turn, what say you? Have you used a photo book program you recommend? Share here! My name is Amy and I am the new Director of Marketing at Viovio. Viovio is an online book creator that offers the largest amount of sizes and binding options in the industry. Our prices are competitive compared with Shutterfly and other photo book creators. I enjoyed reading your detailed review. We would love to see Viovio thrown into the mix as we are confident our quality and prices are better than both. Hi Amy, thanks so much for your comment. Now I am very curious about Viovio, and will try it out next week and do a blog review here!